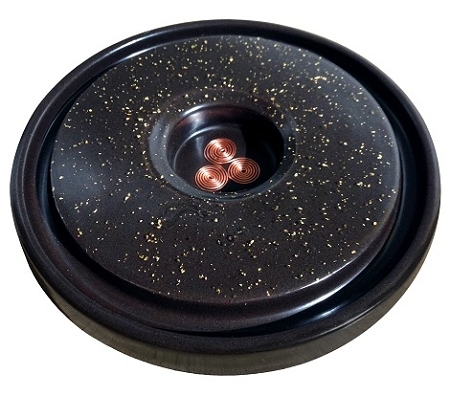 The Orgonite Water Cradle base is handmade with iron oxide powder, copper powder, quartz sand, muscovite mica flakes, shungite powder, paramagnetic rock powder, and gold leaf, with a copper triskelion embedded in the center. (The NEW design also includes silver leaf). The original base measures 7 inches in diameter, and is 3/4 inch deep. This base has a depression for the placement of a full cubit copper Tensor Ring around the outer edge. Weight: 2 lbs. The NEW base measures 5 inches in diameter and is 1 inch deep. The new base now includes gold AND silver leaf in the top layer. It also includes frankincense in the mix. The New base was designed to accommodate either a single Tensor Ring (placed around the outside of the base) or the set of three Rings. The NEW base is taller so that the Water Cradle hangs rather than sitting directly on the orgonite. This helps the water to breathe. Weight 1.75 lbs. Orgonite is a term used to describe layers of metal and other inorganic materials encased in resin for the purpose of focusing life force and dispelling negative energy. The term comes from the word “orgone,” coined by Wilhelm Reich in the 1940s. Reich discovered that by layering organic and inorganic materials, life force energy (orgone) could be concentrated. Orgonite is a modern way of concentrating life force. The mixture has a powerful ability to neutralize negative energy and transform it through re-organization. 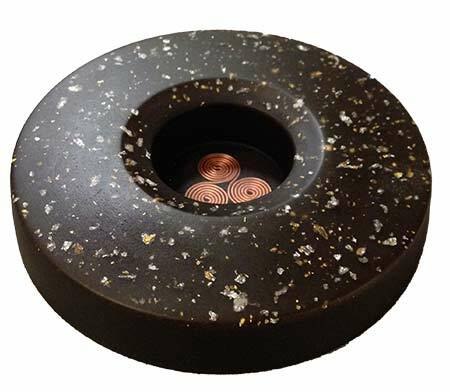 Orgonite is used to protect environments from electromagnetic frequencies, power lines, microwaves, cell towers, geopathic stress and other forms of disruptive energy. Depending on its size and the materials used in construction, orgonite can protect a glass of water. a room, or an even larger area. Orgonite also structures water; it attracts life force, and it protects/enhances water’s liquid crystalline matrix. When used in conjunction with the Water Cradle, the orgonite Water Cradle Base helps to create full-spectrum, living water within 2-3 hours (depending on the quality of the source water). The longer water sits, the more energetically refined it becomes. The unique combination of laminar crystal and golden ratio geometry in the Water Cradle, with the Orgonite, Tensor Ring and shungite (sold separately), tap into the creative forces of the universe. When used with love and gratitude, this combination brings in the fundamental blueprint for creation which is intended to be carried in water throughout the universe. Read more about orgonite. The Orgonite Water Cradle Base is intended for use with the Water Cradle but it is sold separately here and can also be used underneath a pitcher or other water container. It can be placed under a dinner plate to reduce the harmful effects of pesticides, preservatives, and other food additives. Please select which base you want from the dropdown menu when ordering.